It was a really rough start for Ryan Villopoto as he crashed during practice chipping a bone in his big toe. He wasn't looking to be in riding form as he limped into his trailer, but he surprised everyone by coming out in the main with a great start. 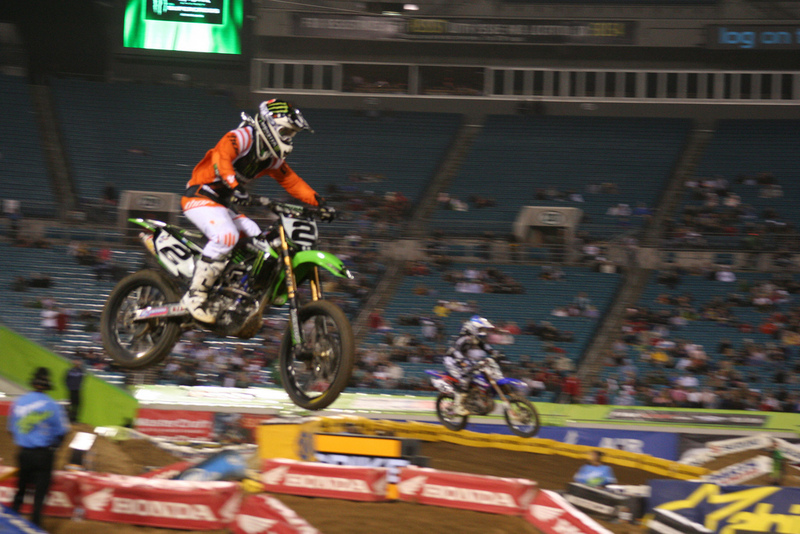 Ivan Tedesco got the holeshot, but in not much time he found himself in fifth. 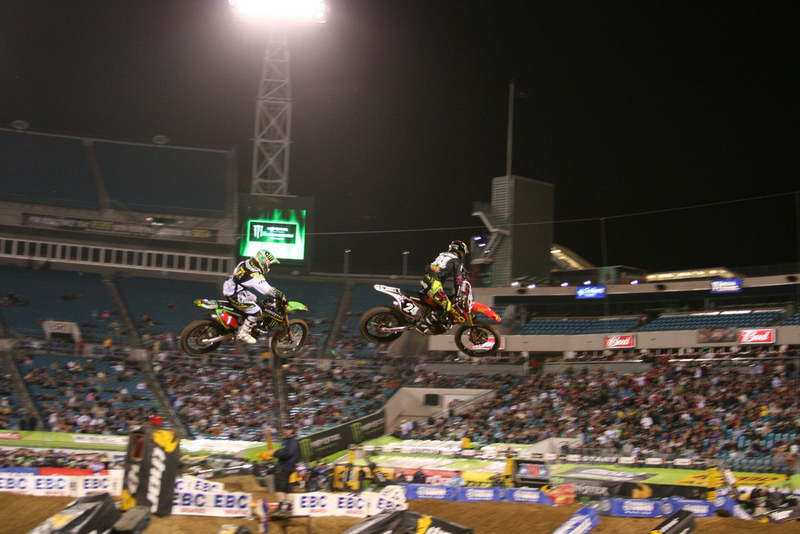 Windham, Villopoto(#2 pictured), and Dungey got into a quick lead and the trio began to put some distance on. 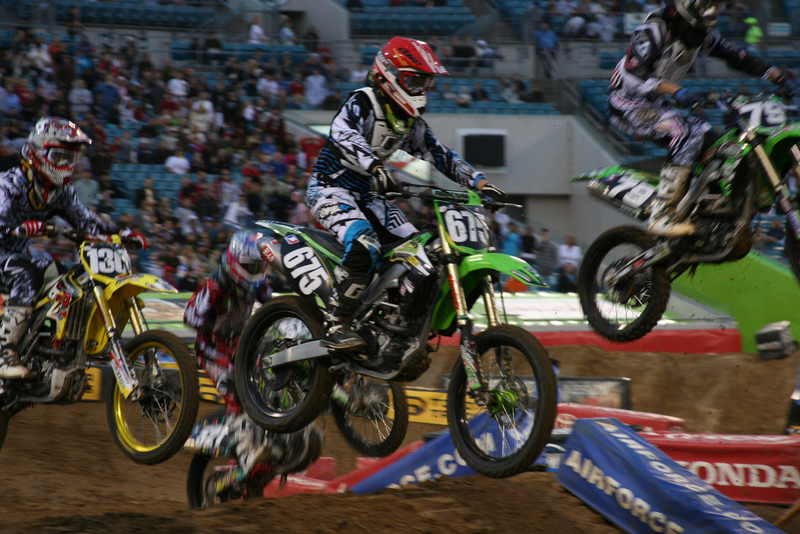 Shortly after the first corner, Villopoto made his winning pass and went on to lead all 20 laps. Dungey got by Windham, but it was too late to catch Villopoto once again. Dungey still maintains his points lead at 21 up however, but Villopoto makes up another 3 with this win. 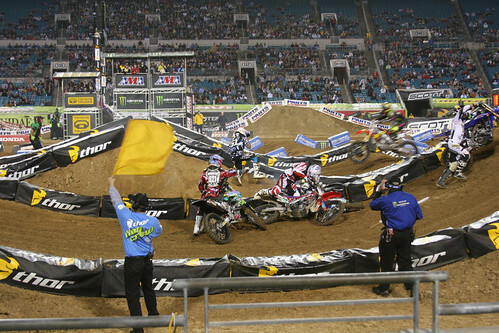 "Yeah, you know, it's awesome," said Villopoto. 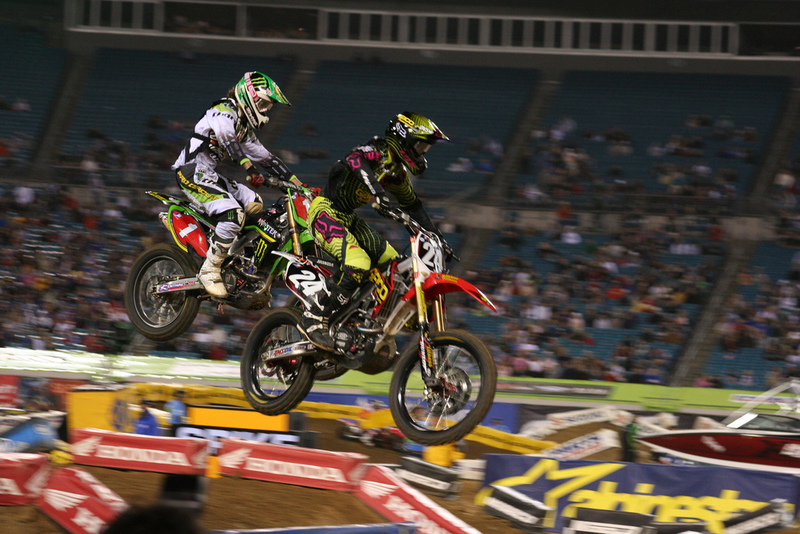 "(I) got two good starts in the heat race and the main event. It started out as a rough day, going down in practice. I hurt my foot and went down the next lap after I finally got back up. I sat out the second practice because of it, so it was kind of a bummer of a day for me but this feels great." 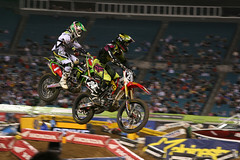 It was Trey Conard's last night on the big bike before he goes back to his Western Lites division and he wanted a win bad! He has been pretty consistent by getting on the podium regularly. He got a bad start, but came back to pass Windham mere feet before the finish line to take 3rd getting on the podium once again! Conard will be someone to watch when he goes to the big bikes for good next year. 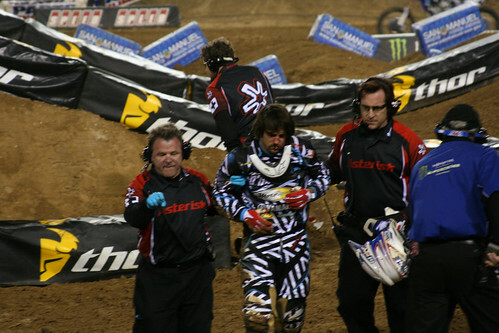 He's proven he can hang, although he was never able to keep up with Dungey or Villopoto for more than a few laps. I didn't think he had it in him to pass Windham, but he proved me wrong! After winning the first three races of the season, Pourcel battled a pair of tough outings over the last two weeks, but returned to his tactical form in Jacksonville. Privateer KTM rider Kelly Smith, of Ludington, Mich., grabbed the Spike Holeshot Award with Honda of Troy's Sean Lipanovich, of Cairo, Ga., and Kenny G Performance Honda's Jimmy Decotis, of Peabody, Mass., following in second and third, respectively. Before the completion of the first lap, GEICO Powersports Honda's Brett Metcalfe, of Lake Elsinore, Calif., moved into the lead, bringing Rockstar/Makita Suzuki's Austin Stroupe, of Lincolnton, N.C., and Pourcel along with him. The trio quickly gapped the field before Pourcel made a pair of great passes to take the lead on lap six and never look back. 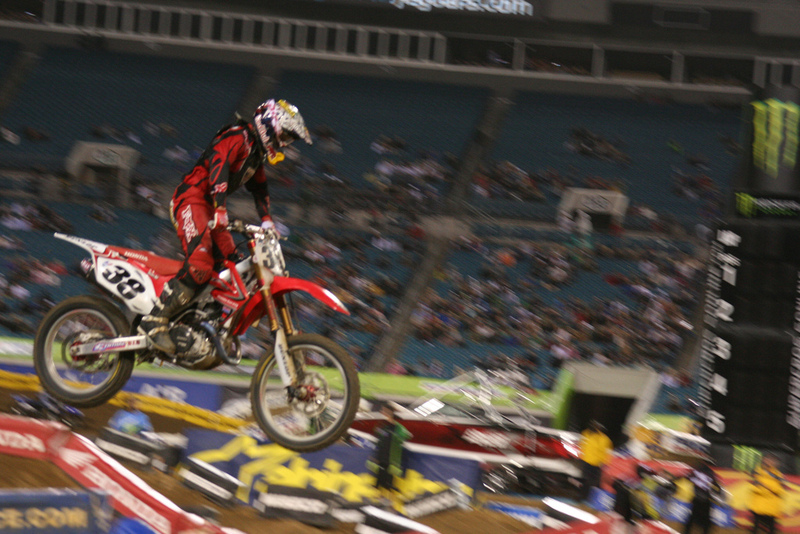 Stroupe kept his rival honest, finishing in second while Metcalfe held on for third. The 2010 Monster Energy AMA Supercross takes the Easter weekend off before resuming action in two weeks from Reliant Stadium in Houston, Texas where Chad Reed is rumored to make his return.